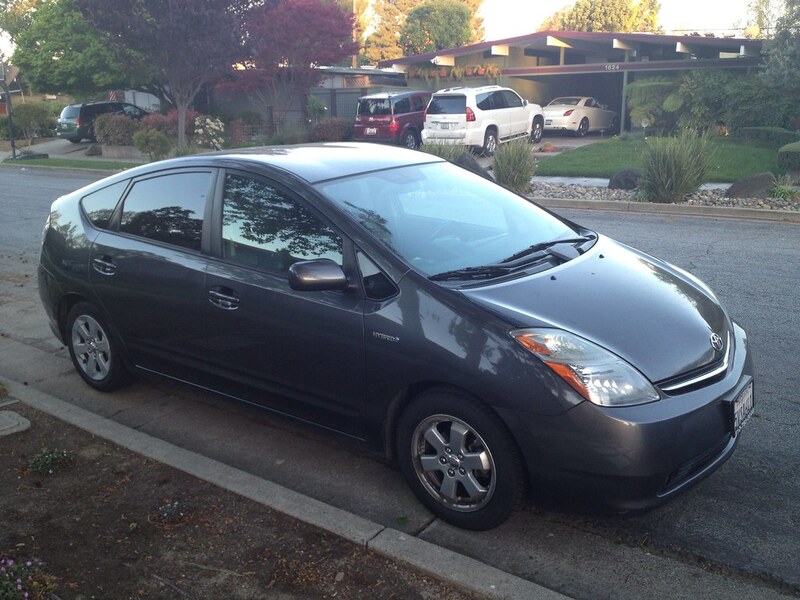 Today, I bought a 2006 Prius with all the goodies (nav, leather, xenons) and 107,000 miles for $10K. I am also a big car enthusiast. Why would I do this? In about a week, I’ll have a hundred mile daily commute, and my two cars are an Evo X and a NA Miata. The Evo is safe but thirsty. The Miata is fun but not the safest car to commute in over long distances. Looking at $5/gal gasoline as a model, in the Evo I was averaging about 20 mpg. With a 100 mile daily commute, this equates to $25/day in fuel, or $6500 a year, assuming a 260 day work year. The Prius will get about 50 mpg, which is $10/day in fuel. So I’d be spending $2600/year in fuel. In fuel costs alone, I will almost completely pay for the Prius in under four years. But that’s not the only part of the equation. With six airbags, my Prius has high crash test ratings across the board. Since my chance of getting in an accident is related to my time in the car, it was important to me to get a modern car with excellent crash safety. With standard ABS and stability control, I also have a degree of active safety where I can avoid accidents in the first place. Over each year, I will put about 26,000 miles on a car. My Lancer Evolution X MR with 40,000 miles is worth almost $30,000, according to Kelley Blue Book. Its value has remained steady year over year, so let’s see what happens when I add 26,000 miles to it. Oof. A 66,000 mile Lancer Evolution is worth about $26,000. That 26,000 miles removed about $4K of value alone from my car. Adding another 26,000 miles for the next commuter year drops my car to $22,000. So between the fuel savings and the reduced depreciation on my Evo, the break even on the Prius is under two years. This assumes that after 2 years my Prius is worthless, which it won’t be. In fact, adding 26,000 miles to my Prius removes only about a thousand dollars from its resale value. So depreciation is four cents a mile, as opposed to twelve on the Evo. Each mile in the Prius costs ten cents in fuel, as opposed to twenty five cents on the Evo. So I’m paying $.37 a mile to drive the Evo, and $.14 a mile to drive in the Prius. I have nothing bad to say about the durability of my Evo. It’s the third I’ve had and the previous two were the most reliable cars I’ve ever owned. These cars are bulletproof- as long as you do the maintenance. The Evo is a complex machine. The transmission has dual wet clutches, and six speeds. The rear and center differentials contain three clutches for torque vectoring. All this stuff needs TLC, and between fluid changes, brake pads, and tires, a year of commuting can cost a couple thousand dollars. The Prius, on the other hand, is actually much simpler mechanically than most cars. Despite the clever Hybrid Synergy Drive, the transmission is a simple planetary differential. Six gears and two brushless AC motors combine with the internal combustion engine to give you all the ratios you need. There are no clutches or torque converters to wear or break. The mechanical brakes only operate in panic stops and under 7 mph, and last hundreds of thousands of miles. The battery, which is the source of lots of fear and unwarranted depreciation, is a Matsushita prismatic NiMH pack that has a ten year/150K mile warranty in CA. This warranty is rarely used- Consumer Reports tested two 200K mile Priuses and found virtually no difference in performance and efficiency from new. The market for replacement packs is nil- a used pack in perfect operating condition costs only $500. Even assuming the worst, a $3000 replacement pack, I’m still ahead. Even the electronic systems are easy to source and plentiful- Toyota has sold almost over 2 million Priuses to date, and most of them are the second generation model I purchased. So I’m of the belief that a Prius will last forever, yet they depreciate as much as any normal car. I’ll be the first person to say that $25K on a hybrid doesn’t make much financial sense, even at $5/gallon. $10K for a durable car that gets 50 mpg makes a lot more sense. The fact that the Prius is so normal to drive while being so radically different speaks to its purity of intent. Reading “The Prius That Shook The World“, I learned of a surprisingly ambitious Toyota reinventing major technologies time and time again to build a viable parallel hybrid at a reasonable price. The Prius was not engineered to be a drivers’ car, but to be a reliable and efficient car for the 21st century. From its Kammback design to the power split device and motor generators, this is a car that was designed from the ground up as a hybrid car for the future. In ingenuity and imagination, it reminds me of the first generation Mazda Miata in how it represents a singular vision of brilliant engineering. The Prius was Toyota’s Lexus moonshot of the late 1990’s. Just like the Lexus LS400 of 1990 was overengineered to create a luxury market for Japanese cars in the US, the second generation Prius was designed to create a market for efficient and reliable hybrids. It’s a car that was created to move a market, and it shows. In 2006, a $25K car with DVD navigation, bluetooth, keyless entry, rearview cam, and HID headlights is not a car that was earning lots of cash for its maker. If I were to be completely rational, I would sell the Evo and Miata and just motor forever in my Prius for fourteen cents a mile. But I’m not. I’m a car nut. The Prius appeals to my rational brain, but having a tiny understanding of the witchcraft that gives me 50 mpg also makes me giggle. But I want a car for the track, and a car that I can drive down the coast with the top down. The Prius lets me have a comfortable, cheap, and reliable travel pod that also happens to ooze with brilliant engineering and technology. On the weekends, I’ll be enjoying my pristine Evo and Miata, thanks to the Prius. This entry was posted on Sunday, April 14th, 2013 at 11:07 pm	and is filed under cars, Uncategorized. You can follow any comments to this entry through the RSS 2.0 feed. You can leave a comment, or trackback from your own site. I went through similar logic. FWIW, gas costs 2X more in Japan than in the US, so fuel efficiency is even more important. If you only have one car then spending $25,000 on a new hybrid makes sense. Especially when the cost difference between said hybrid and an equivalently equipped car is minimal. I’d disagree, mainly because of depreciation. A $10K hybrid is so durable that its a much better alternative than paying full price, if your only consideration is money. The decision to buy a new car is mostly rooted in irrational excitement rather than real considerations of environmental impact or cost saving. Which, to be clear, is something I’ve done quite a bit- I just make peace with my irrational self. Also, if you’re replacing a usable car, the argument that you’re buying a new car to save money almost never makes financial sense. Cars are statistically better than they’ve ever been, so a lot of marketing goes into making people buy cars they don’t need. Like I said, I don’t pretend to be perfectly rational, like most humans I strive to make compromises in my life that balance logic with emotion. Very good rational reasoning. I completely agree. As a matter of fact, I went through the same thought process before I bought a 6 years old 04 Prius. For 12 cents per mile, it even included the depreciation cost for me. Buying a 100K mile gen II Prius is the very best value car on current market, especially if you commute 100 miles a day, like I do. I am very happy you compared gen II Prius with 1990 LS400. I have the exact same view. My second car is actually a 1998 LS400 that I bought in 2007 for $12K at 110K miles. Not many people knows how great this car is. But if you read edmunds.com consumer review, you will see how the owners rave about it. It is so luxury yet cost so little to maintain, it’s full size sedan, but I am confident to challenge any sports car on the road. I define the (used) LS400 as Economical Luxury Sports Limo.